Do you remember the days when you had to pick up the phone to accept reservations for every single customer that wanted to book? What's that? You still accept the majority of reservations over the phone or through email? You probably need a Booking Mobile App to streamline your business! If that's the case, then it's time to make the jump to a more automated solution. Whether bringing in reservations for a fancy Italian restaurant or having people sign up for personal training lessons, a booking page is one of the most important parts of any mobile app. Not to mention, it makes your day-to-day business procedures much cheaper and easier. What exactly is Booking Mobile App? It depends on the type of business you're running, but in general it has your customers fill out a detailed form to make a booking or reservation. This may range from contact information to specific requests. The booking system then handles the entire process, instead of you having to pick up the phone to take down the details. That sounds wonderful, right? Still not convinced? 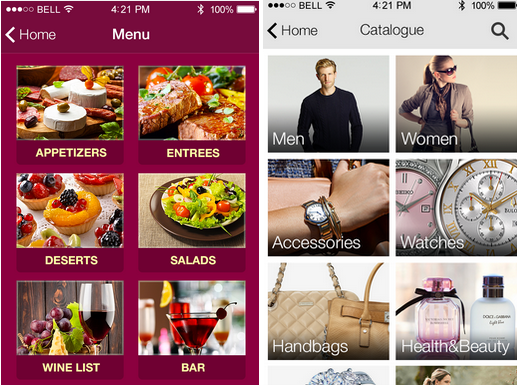 Let's take a look at a few reasons a booking page is essential to your mobile app success. 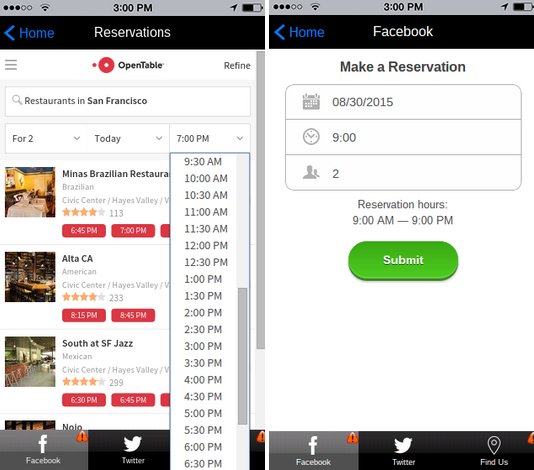 And check out some of the handy booking features including OpenTable, Reservations, Forms and more. A booking page generally integrates with an area that talks about your products or services. The best example for this is a restaurant. When a user navigates to your Booking Mobile App you'd most likely include a button or link to your menu. This way, they can refresh their memories as to what you provide and see if any new items have been listed. Think about Yelp as an example. A general Yelp business page has company information and reviews, but it also provides menu details and links to view websites. Customers expect you to compile this information in the same area as your booking page. Forms and booking modules are customizable in iBuildApp, meaning you can either add information about your business on those pages or even provide a tab for users to navigate to further details within your app. Going back to the Yelp example, your customers also want to see what your hours of operation are when booking a reservation. What better way to prompt a look at your app, and give them that information, than by using a booking page? This is the best reason for going with Booking Mobile App, since it's all about customer service. The point of a mobile app is to make it easier for your customers to get in contact with you, so wouldn't it be nice if someone could book an emergency hair styling session or a last minute personal training workout? iBuildApp has booking Mobile Appointments with Acuity Online Scheduling Software plus it allows using free calendar app. Don't make your users scour the internet for a phone number or search around for where your shop is located. Many app builders use custom forms to design their booking pages, which is a wonderful tactic considering you can generate any submission field you desire. The coolest part is that you can ask people their name, contact information and whatever else helps you understand who is coming in for an appointment. Use these details for marketing in the future and to give out better customer service in your Booking Mobile App. Remember all those phone calls you take for bookings and reservations? Wouldn't that time be better spent elsewhere in your business? When you implement a booking system you cut costs and free up time. If you have someone else accepting the bookings, you can now designate them to work on other tasks. Consumers have their phones on them at all times, so what better way to remind them that you your company exists than by getting on one of their most precious items? A valuable tactic for any business is to get your brand on those phones, and a way to convince customers to download is with quick booking forms. When was the last time you took a booking or reservation over the Booking Mobile App or through email? If you think it's time to automate that process, browse the iBuildApp features to locate booking modules. That said, let us know in the comments if you have any questions. Joe Warnimont is a freelance tech writer who mans the iBuildApp blog, along with his personal Write With Warnimont blog. When not playing around with apps and gadgets, he's brushing up on his German or riding his bike in Chicago.